It’s been about a month since my first blog entry. 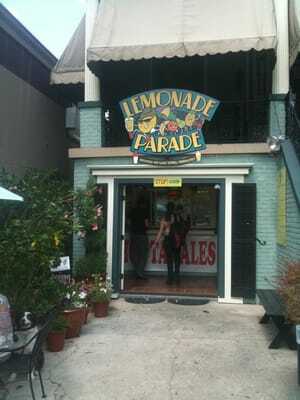 Jenny and I are still working on Lemonade Parade and Venezia’s. We’ve since achieved an interview with the owner of Venezia’s, Mr. Anthony ‘Tony’ Bologna. Mr. Bologna described Venezia’s as a family-owned-and-operated establishment. He was full of pride while explaining that his son and daughter helped re-decorate the restaurant after Katrina destroyed the Canal/Carrollton area. The restaurant has white linen and pictures of Venice on the walls but doesn’t forget its loyalty to New Orleans. Pictures of Saints, LSU, and Katrina memorabilia make the dining and bar area seem like you’re eating at a friend’s parent’s house. The restaurant is busy and the close seating helps spark up conversations between patrons. Jenny and I remarked on our fellow diner’s caper pizza but weren’t disappointed when our veal entrees came out. The food is way more than you can finish and during the interview, Mr. Bologna explained that he kept his prices down for the people and its working because the people definitely come. We watched as the early birds enjoyed their dinner and then were amazed with the swarm of people who came around 7pm for dinner. The building filled with laughter and clinking plates. Mr. Bologna explained that they were originally among the few pizza places in the area, but he didn’t see Dominos or the pending MidCity Market as a threat because it wasn’t the same type of food nor was it the same type of atmosphere or service. He explained that all the restaurants in the area actually helped each other. “The more people the better” he said and continued that even if someone ate next door, they’d say “we have to try that Italian place next time, so they still come.” Jenny and I sat at the bar and enjoyed drinks, more food than we could eat, and then coffee so we didn’t slip into an Italian food coma on the way home. Our bartender/waiter, Chris, was more than accommodating. He’s worked at Venezia’s going on five years and also attends UNO. This showed aspects of the UNO and Canal/Carrollton community merging. Metairie is also a factor in Venezia’s, where their other location is found. Mr. Bologna explained that the street cars increased business because tourists were able to venture to different parts of the city, including MidCity, and he appreciated this. But, he still made sure to treat his loyal local customers with reverence. After Katrina, this reverence became even stronger. He explained that he was touched to find out that people who were displaced, temporarily and, or permanently, still kept Venezia’s on their list of New Orleans must haves upon returning or visiting home. Mr. Bologna explained that his contribution to Venezia’s was built on the idea of family and that his mission was to perpetuate that feeling through his service and food. Compared to the bustling inside of Venezia’s the outside is relatively unassuming. The sign is neon lighting—part of its method of marketing may be, as an authentic Italian restaurant located in New Orleans, the very lack of seemingly deliberate marketing. It’s plain, rustic, white-walled exterior lets the food speak for itself. 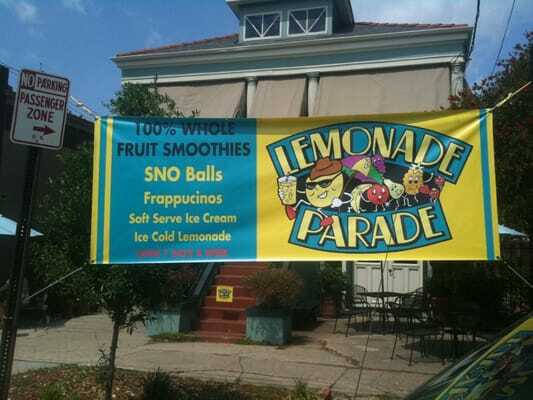 Lemonade Parade’s logo is reminiscent of the 1950s era dancing fruit commercials and reminds me of the Prytania Theater’s “Let’s all go to the movies” clip. Mike and Lori Bennencourtt also own The Peanut Gallery which hosts exhibitions and other community events. Some of the same people involved with the gallery seem to be involved with Lemonade Parade—extending the Canal/Carrollton community reach. The exterior brick is light blue and their sign is canary yellow with dancing fruit. They’ve compensated for their visibility problem by placing huge yellow banners in front that does attract attention. 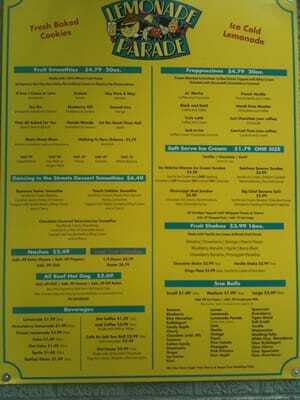 They have tables outside for seating and this seems to be the way to enjoy Lemonade Parade. This atmosphere works nicely as the community is the backdrop of the restaurant and patrons are literally surrounded by the area as they enjoy their food or beverages. This also yields more community involvement as those passing can engage with patrons, see the items they have to offer, and momentarily become a part of the restaurant’s atmosphere. 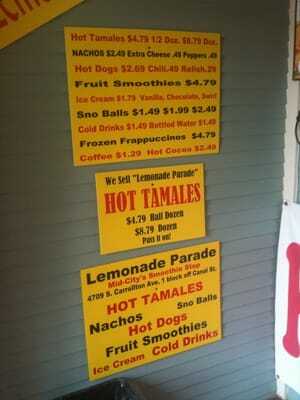 It seems like Lemonade Parade’s patrons are mostly from the MidCity area. This entry was posted in anthropology, cuisine, culture, ethnic food, food writing, heritage, history, Mid City, nationality, neighborhood, New Orleans, pizza, restaurant cluster, restaurants, Uncategorized, University of New Orleans and tagged food anthropology, midcity, neighborhood, New Orleans, university of new orleans. Bookmark the permalink.